The recent recall of eleven brands of imported lead-containing crayons by the Consumer Product Safety Commission (CPSC) highlights the problems of monitoring the hazards of children's art materials. This problem has two facets: first, the safety of art materials manufactured for use by children; and, second, the inappropriate use of possibly toxic adult art materials with young children. The Labeling of Hazardous Art Materials Act (LHAMA), passed by the U.S. Congress in 1988, required that all art materials with chronic or long-term hazards have appropriate warnings on the label. If there are hazards requiring a warning label, then the label must state that the art material is inappropriate for use by children. To be in compliance with the law, the label on an art material must also contain the statement "Conforms to ASTM D-4236" (or similar wording). Although substantial progress has been made in the proper labeling of children's art materials manufactured in the United States, the CPSC's recall of these crayons, all produced in China, reveals continuing problems with imported children's art materials. Art materials manufactured in other countries, particularly in the Far East, often do not meet American health and safety standards. The Consumer Product Safety Commission is examining imported art materials, but it is impossible for them to test all imported art materials. Unfortunately, imported art materials are often less expensive than American-made art materials. 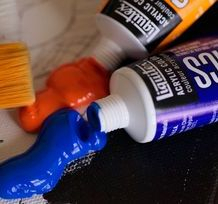 Schools and other educational buyers of art materials often rely on "low-bid" estimates to determine purchasing choices. Unfortunately, our experience at the Center for Safety in the Arts and other surveys indicate that many schools are not using art materials labeled in compliance with the law. Similarly, as shown by the list of crayons recalled by the CPSC, other bulk buyers of children's art materials, such as chain and discount stores - also use low-bid procedures. These low-bid items are often older inventories discounted for clearance purposes. The CPSC stated that all recalled products were imported, and most were actually imported before 1990, when the CPSC issued regulations implementing the Labeling of Hazardous Art Materials Act. The second problem is the continued use of toxic art materials in elementary schools, after-school programs, and even day care centers. We have received many complaints from parents about the art materials used in elementary schools, and many art teachers have said they use art materials that our research has shown to be hazardous. Children in grade six and below should only use non-toxic art materials. These have no health hazard warnings, and have the statement "Conforms to ASTM D-4236" on the label. Hazardous art materials such as rubber cement, permanent felt-tip markers, lead-containing pottery glazes, adult paints, and spray fixatives have no place in an elementary school classroom. In fact, the Labeling of Hazardous Art Materials Act also gave the Consumer Product Safety Commission the authority to obtain a court injunction against any school purchasing chronically toxic art materials for use in elementary schools. However, individual elementary schools and even school districts usually do not have the capability to evaluate the toxicity of art materials. Many educators, including many art teachers, aren't even aware of the requirements of the Labeling of Hazardous Art Materials Act. We believe it is the responsibility of the various state education departments to ensure that all schools in their state are in compliance with this law. A written policy on the purchase and use of children's art materials should be developed and then distributed to all elementary schools. This policy should modify low-bid procedures to require non-toxic art materials with appropriate labeling. In case of doubt, as with imported art materials, the Consumer Product Safety Commission should be contacted or independent analyses conducted. Educational programs for art teachers and other elementary school teachers teaching art are necessary to ensure that art teachers are aware of the law and the hazards of art materials. In our experience, teachers are eager to learn about the hazards of art materials, and can often suggest safer alternatives to other more hazardous art materials.